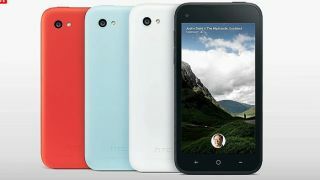 The first phone to come with Facebook Home built in is coming to the UK, with EE set to range the HTC First in the UK. It sports a 4.3-inch display, dual-core processor, runs Android Jelly Bean and will arrive in four colours; red, black, white and pale blue. That's all we really know for now, with the handset hitting the US on April 12 but no release date announced for the rest of the world. EE says said: "The HTC First will be exclusively available this summer on EE's superfast 4GEE service, with details on pricing and availability to be announced in due course." In the US, the handset will sell for $99, so we're anticipating a UK price tag of about £100, while there are sure to be contract deals in the works too. The HTC First is as close as we're going to get to an official Facebook Phone, with CEO Peter Chou hopping up on stage at Facebook's Android Home event to reveal the handset to the world. Facebook Home is the eponymous social network's new deeply-integrated Android overlay which brings all manner of Facebook shenanigans to your phone's homescreen and notifications bar. We're on the case with EE and HTC so we'll bring you more details on the HTC First UK release date and pricing as we have them.